As expected, the charitable deduction has been retained; however, the bill doubles the standard deduction, which will lead to a significant decline in the number of taxpayers who itemize. The ability to itemize is a driving force for charitable giving. It’s expected that charitable contributions could decrease by $12-20 billion next year. The universal charitable deduction that would be available to all taxpayers, whether they itemize or not, is not included in the final tax reform bill. 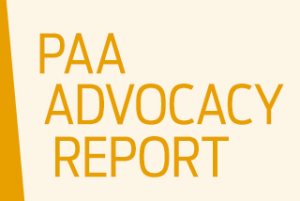 PAA member organizations, along with our nonprofit parters, have long advocated to Congress to preserve the full scope and value of the charitable deduction; this legislation does not do that. The Senate and House are expected to vote on the final tax bill this week. Lawmakers need to hear from the charitable sector about our disappointment in this new legislation and that we are paying attention. It is important for Congress to continue to hear from constituents about how tax reform will impact our work and our ability to support our communities during and after the vote this week. Tell them this final bill will hurt charities, and more importantly, the communities we serve will feel the impact. Tell Congress that tax reform does not preserve the full scope and value of the charitable deduction. Let Congress know that charities will continue to advocate for a universal charitable deduction that will incentivize all Americans to give and support the organizations that they care about. Voicing your opinion to your elected officials can help set the stage for a better future, and every message you send makes a difference! If you contacted your elected officials in response to our most recent Action Alert (November), thank you–and please take action again today. Limitations loosened on charitable deductions for itemizers: For taxpayers who would continue to itemize returns, both the House and Senate bills raise the limit on the deductible amount from 50% of adjusted gross income to 60%, potentially incentivizing more giving by those who had reached the 50% cap. Both bills also would also repeal the “Pease limitation,” which currently reduces total itemized deductions for high-income tax payers.